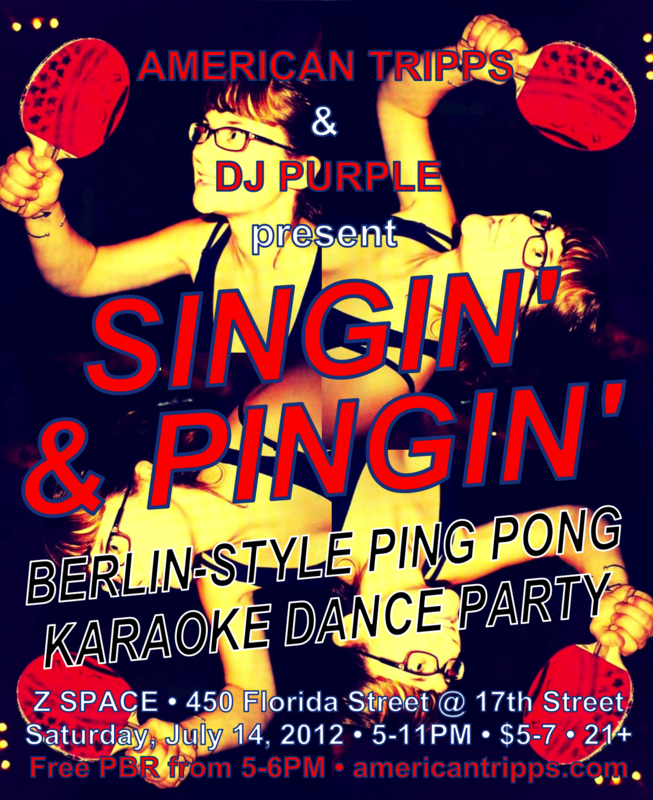 Singin’ and Pingin’: Dance karaoke and Berlin-style ping pong together under one roof this Saturday night! Well, this is a dream come true. My two favorite parties in the world, coming together for what will likely be the best superparty the world has ever known. It’s Berlin-style ping pong, in the factory-turned-performing-arts-theater known as Z Space, with DJ Purple‘s newly reborn DANCE KARAOKE party providing the soundtrack. OK, so the PINK BOOKS are basically taking the DJ Purple DANCE KARAOKE concept and giving it a thorough overhaul and update. The basic idea of “no slow songs” has been taken into every nook and cranny of the song book, searching out those few remaining “clunkers” as I like to call them – songs that kill the momentum of the dance floor. I’ve also changed the name from “The Ultimate Karaoke Dance Party” to “DANCE KARAOKE” for a few reasons. Most important is that it puts the emphasis on dancing as the FIRST priority, not just an afterthought. In the past, I would use the “Party” part of the name as an excuse to include songs that were fun, but didn’t really keep people on the dance floor. In the new books, every single song (2,436) has been carefully evaluated for dance potential – WAY more carefully than in the old book. For the last nine months, I’ve devoted pretty much every free moment to this. Of course, it’s still a karaoke show, so it’s not all EDM – it still requires people to be open-minded enough to dance to rock, swing, country, etc. We tried something similar several years ago at Zen Lounge in Mountain View – I created a special “Super-Dance Karaoke” book – and the result was incredible – we had a packed dance floor all night for karaoke. Imagine the karaoke lyrics up on that giant movie screen, and four ping pong tables worth of ping pong action! This is going to be epic. RSVP and invite your friends! Oh, and be sure to check out DJ Purple’s songbook in advance. CONTEST: Win tickets to a ping pong party and a punk show at El Rio this Saturday! Two big-ticket parties at El Rio on one big-ticket date! First there’s the triumphant return of American Tripps to the Mission, which we mentioned yesterday. 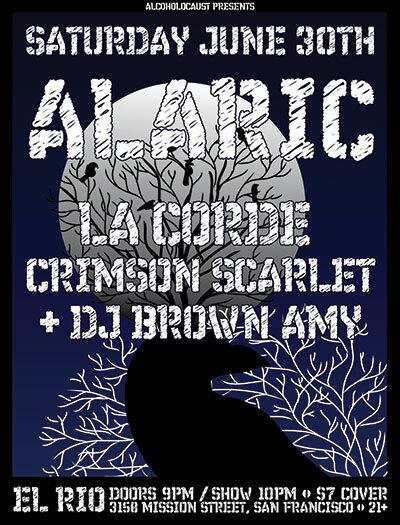 And then stick around as the sun starts to set for a thrilling night of distortion-drenched punk rock courtesy of Alaric, Crimson Scarlet, and my band La Corde! This is going to be our only show of the summer, so don’t say I didn’t warn you when you’re suffering from withdrawal sometime in September. Also, it’s going to be Alaric’s last show for a looooooong time, as they are taking a break to write and record a new record. Oh, and DJ Brown Amy from Hard French will be spinning records in between sets! Check out the details and tell your friends about it here. Oh, and I almost forgot about the best part: We’re offering 2 FREE tickets to BOTH events for whoever can come up with the best story in the comments about the craziest punk rock show they ever attended, whether it happened at 924 Gilman, ABC No Rio, or even your mom’s basement. The contest ends at noon on Friday, and winners will be judged on merit. 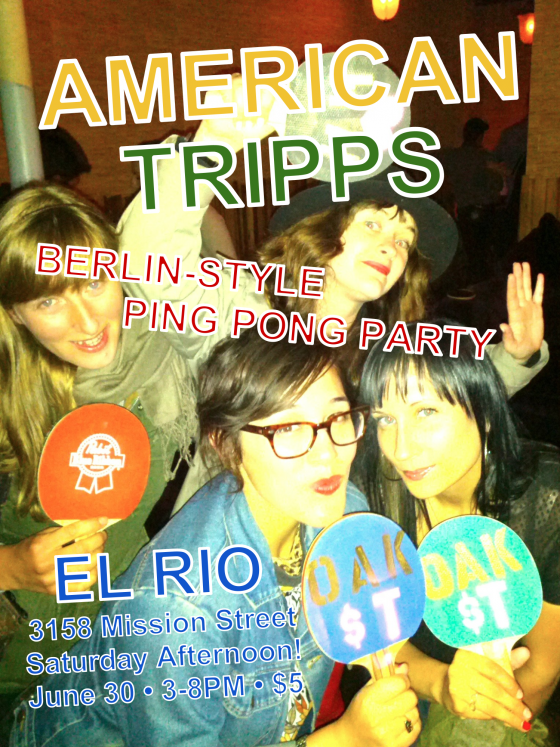 Berlin-style ping pong returns to the Mission this Saturday afternoon at El Rio! It’s been two long months since we had a party in the Mission, but we’re coming back full force! El Rio, if you’re not familiar, is one of the finest party venues in the city, and we’ll have ping pong tables set up in each of its three spaces – front room, back room, patio. DJ Joe Finkel will be on the decks, spinning rock ‘n’ roll, glam and power pop, and Rocky’s Frybread will be on the scene in case you get hungry. This is gonna be siiiick!! El Rio rules! Daydrinking rules! Joe Finkel rules! Rocky’s Frybread rules! 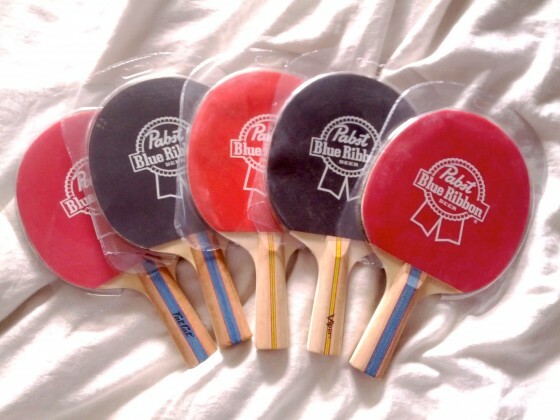 Ping pong ping pong! RSVP and invite your friends! 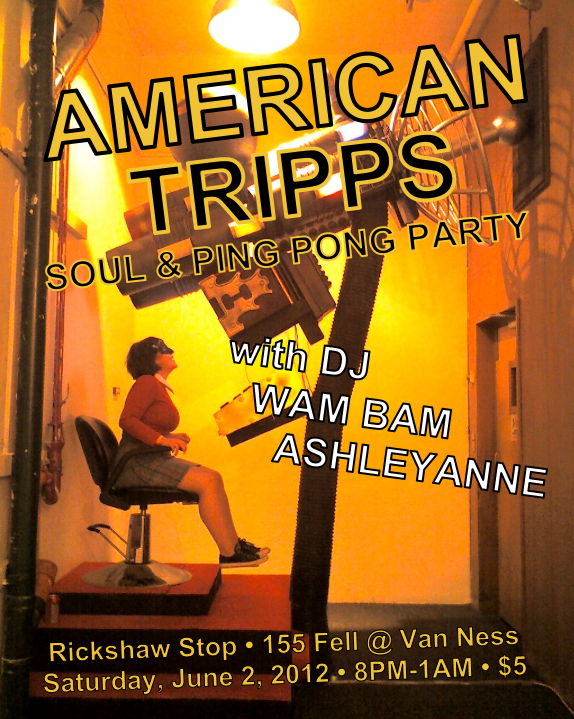 DJ Wam Bam Ashleyanne brings a little bit o’ SOUL to the Berlin-style ping pong scene this Saturday night! This is gonna be big. Ashleyanne was on the decks for last fall’s epic American Tripps Halloween party (pretty party pics here) and she brought the house down. 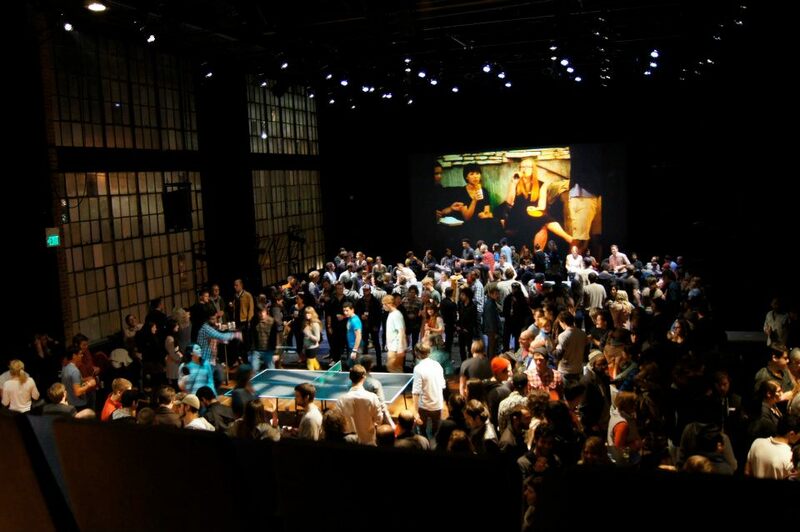 This time, the party’s at Rickshaw Stop, which means dancing on the main stage, two ping pong tables, foosball and skeeball on the upstairs mezzanine, and lots of Rickshaws to lounge in. Plus, it’s just rare that we get to play ping pong along to some classic soul music. All 45s, all night long! RSVP and invite your friends! Bethany and Jake met at an American Tripps party last year, and they hit it off like crazy, and everyone that knows them agrees they’re staggeringly perfect for each other. Friday night, Jake got up on the big main stage at Rickshaw Stop and popped the question. 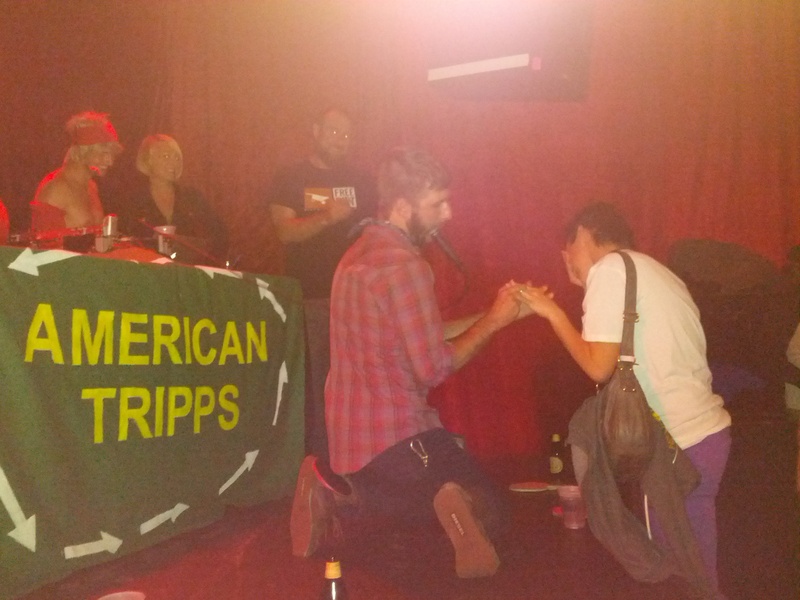 Bethany said yes and the whole crowd cheered (and I almost cried). Best wishes, you guys! Berlin-style ping pong + Bethany + Jake 4ever!!!! 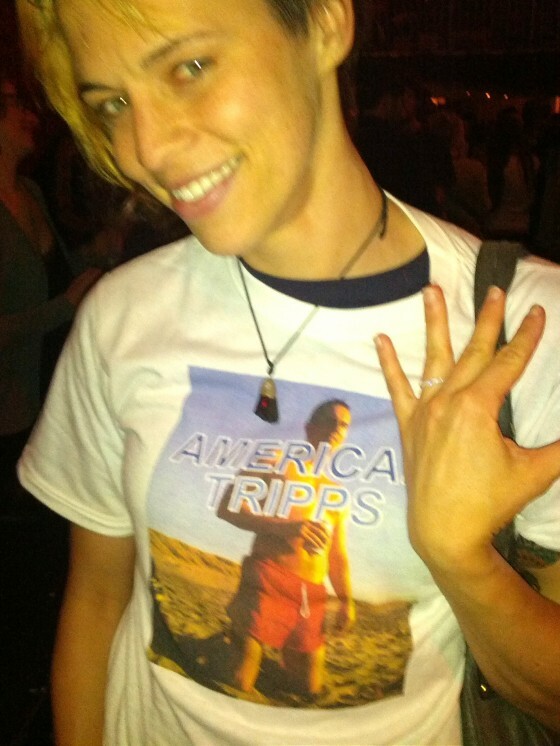 American Tripps returns to the Rickshaw Stop this Saturday night for a SOUL PARTY, with DJ Wam Bam Ashleyanne spinning soul 45s long into the night. Bethany and Jake will likely be there and you can offer your best wishes. RSVP and invite your friends — maybe somebody will propose to you! Hip hop and ping pong, together at last – finally! 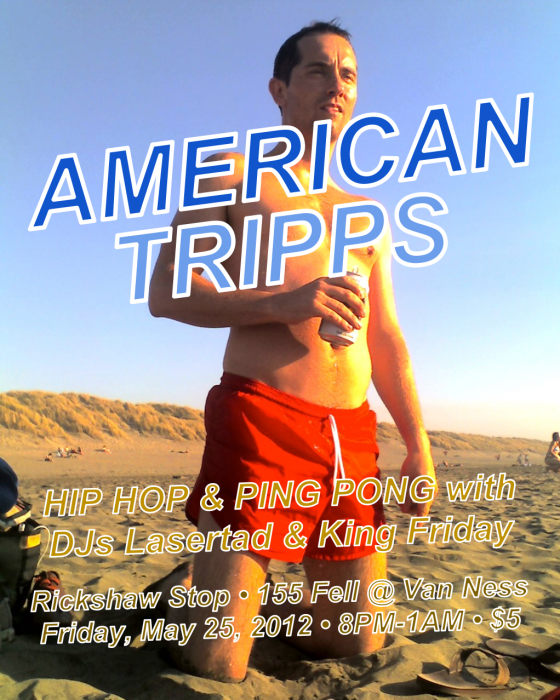 AMERICAN TRIPPS history will be made when DJs Laser Tad (aka Tad Teste) and King Friday bring a dose of hip hop to our party for the very first time. 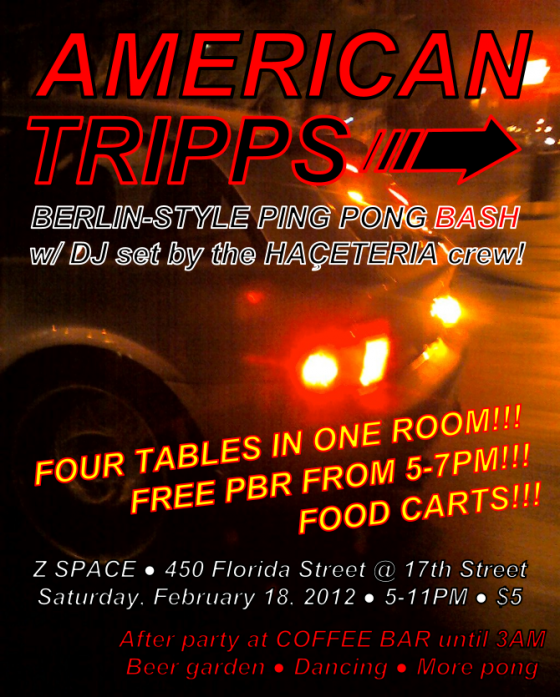 It’s gonna be chill ’90s hip hop, upbeat, feel-good jams sure to go hand-in-hand with BERLIN-STYLE PING PONG ACTION. (Think De La Soul or “Feel Me Flow,” nahmean?) Don’t miss this. Furthermore, we’re at Rickshaw Stop this time, so there’s FOOSBALL and SKEEBALL also, plus a full bar and lots of sofas and RICKSHAWS to sit on. Dance party on the main stage! Dance party on the main stage! RSVP and invite your friends! 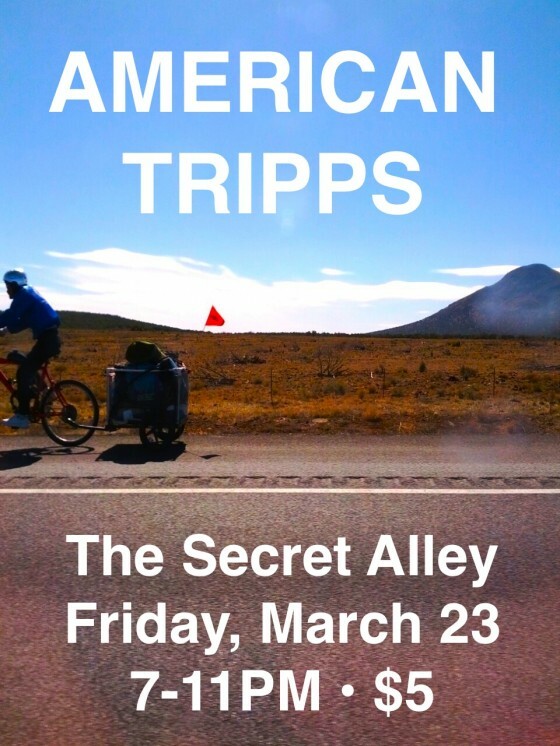 American Tripps at the Secret Alley tonight! You guys asked, we listened. “When are you gonna do it in that GIANT WAREHOUSE again?” Well we’re doing it, and starting at 5PM on a Saturday afternoon this time, so’s we can all get an early start. • FOUR TABLES in one enormous room! • Music by the HAÇETERIA crew!! • FREE PBR for the first two hours!!! • Food carts out front all night long! After party at Coffee Bar right across the street, just like before. They’ll be running a kickass Berlin-style beer garden, just like before. With more ping pong in the back room, just like before. Our pals from Sports Basement will be in the house this time, performing FREE BIKE TUNEUPS for the first two hours, raffling off a $50 gift card, and handing out coupons in case you’d like to pop around the corner to their store and pick up some ping pong paddles of your own.